Meet Sparky and the Smarts - an ordinary family who frequently find themselves in extraordinary situations!Surprise, surprise: Mrs Smart is on a mission to arrange a surprise party for Mr Smart's birthday - but his own party-planning conspiracy is bound to throw a spanner in the works! How will Sparky help them avoid a total calamity? 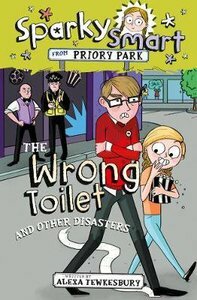 !The wrong toilet: Stanley's got some new glasses, but things go horribly awry when he loses them at the cinema. He's about to get into a right old mess!The bee in Mr's Smart's bonnet: Grandad Bagg has been spending quite a lot of time with one of their neighbours, a lovely widow called Mrs Pringle. So much time, in fact, that Sparky's mum is convinced that romance is in the air! About "The Wrong Toilet and Other Disasters (Sparky Smart From Priory Park Series)"